Last month’s Resiliency Conference brought together about 500 teachers, administrators, and parents at the Edward D. Hansen Conference Center at Angel of the Winds Arena in Everett to learn how to better support children who have experienced trauma. 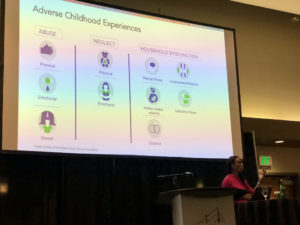 Dr. Nadine Burke Harris, a national expert on the health effects of Adverse Childhood Experiences (ACEs), kicked off day one of the two-day gathering with a moving keynote presentation. Dr. Burke Harris pointed out the sobering fact that that one in eight individuals have experienced four or more ACEs, and 35 million children have ACEs right now. ACEs are related to our flight-or-flight response. When we experience trauma, our body releases adrenaline and cortisol, which inhibits our brain’s pre-frontal cortex (the area responsible for thinking) and gets us amped up. This stress response can help us avoid immediate danger, like running into a grizzly bear in the woods, but becomes problematic when the threat happens over and over again, like in an abusive home or if there are multiple changes in caregivers. If we experience chronic trauma, we have difficulty turning off our stress response, we have an increased fear response, impaired executive function, difficulty with learning and memory, and we tend to engage in riskier behavior. In the classroom, this can look like attention deficit hyperactivity disorder (ADHD) and defiance. To help students with ACEs who show ADHD symptoms, Dr. Burke Harris strongly recommends providing safe places to reduce stress, with supports from teachers and caregivers. Placing mental health professionals and social workers in schools are key, in conjunction with universal training on ACEs for every adult in the school, from guidance staff to bus drivers to every single teacher. “Nurturing caregiving literally heals us down to our DNA,” she says. 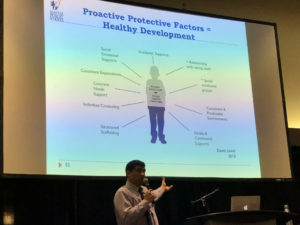 One of the Resiliency Conference breakout sessions was hosted by David Lewis, Director/Program Manager of Behavioral Health Services at Seattle Public Schools, who presented a Lunchtime LEVinar for us last year on how ACEs and childhood trauma impacts student learning. In addition to his work at the district, David hosts trainings on childhood trauma at adoption agencies and for the Seattle Police Department. David began his session with the important observation that “a brain that’s not full of anxiety will retain learning.” A key strategy for him to engage ACEs students is to help them feel a sense of belonging, so that they will feel connected at school. “Our brains look for safety first, before we learn reading, writing, and arithmetic,” he says. In the classroom, David helps teachers create environments that have pro-social practices with high expectations and high supports. “Students with ACEs need nurturing, predictability, and consistency,” he explains. “You can’t punish them out of their behaviors.” The goal is to provide good experiences for our kids, so they can believe the world is a trusting place. A helpful tool is to post a schedule on the classroom wall that shows what comes next, which will reduce stress. And when adults consistently tell students they care, that also reduces stress.